One of my earliest memories was gathering in my Grandmother’s dining room, with her aunts, to prepare food for the Jewish holidays. Everything was made from scratch on the day, from the gefilte fish to the bread, to the roast chicken and all the other tasty bites we would enjoy. The table would be laid in the lounge as we were a large gathering. My Gran’s Uncle, the family patriarch would lead the dinner prayers. The best part of the meal would always be dessert and this was without fail Aunty Tilly’s ice cream. She would make this in the morning and it would wait patiently in the freezer for us to enjoy at the end of the meal. It is the dessert I am always asked to make when we go for family suppers. My Uncle Robert prefers his without alcohol and I make it for him that way. Dave does not like coffee in anything, other than his mug or espresso cup, and so this dessert has never been made by me for him. But with my parents coming to spend Passover with us, I wanted to bring a little bit of my Gran to the table. I made this no churn coffee ice cream to remind me of family! Which dessert reminds you of family? I tried to make a pretty flower of chocolate gelato to surround my ice cream, but not with great success. You can use any flavouring and extracts to make wonderful varieties of this recipe. That being said, I will put it on my list for next summer. Looks amazing! Nice story Tandy. I’m a bit like Dave when it comes to coffee flavouring although a mocha ice cream is always welcome so maybe you could wean him on with that. Or maybe, you could just keep it to yourself! I love coffee ice cream… it looks and sounds delicious. You can’t go wrong with coffee ice cream, all the better if it’s no churn! Hmmmmm, dessert that reminds me of family maybe is pumpkin pie? We’re not a big dessert family sadly so we don’t get to sample too much but I absolutely love this idea of no churn coffee ice cream. Coffee ice cream is my husbands all time favorite, I think he goes through 2 gallons a week! But it perks him up. I have never tried pumpkin pie! Thank you for sharing those lovely food memories – Tandy – then giving us this delicious ice cream! 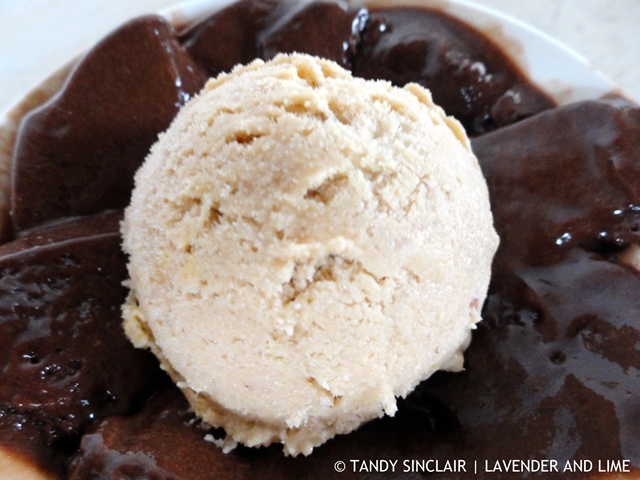 I love how you’ve made this coffee ice cream and I love that it’s quick and easy. Looks like this will be on our table this week! Really nice family recipe to share with us, I love coffee ice cream but cannot remember the last time I enjoyed some. I have 2 desserts that come to mind in my family, both made usually by 1 aunt: Saint-Honoré cake and crispak. I am such a huge ice cream lover and I think ice cream always reminds me of memories that I would have with my family. And I absolutely love how your no churn ice cream came out. It really looks divine. I love a no churn ice cream any day – and I gotta agree, dessert is the best part of the meal indeed! I am absolutely loving this no-churn coffee ice-cream. Super yum! I too make a no churn coffee ice cream but don’t include eggs or alcohol – will have to give yours a try too!